Maybe singing Isn't for me? You are here:Home Articles I feel like my voice misses the mark more than hitting it. Maybe singing Isn’t for me? Do you find that you always say to yourself “I can’t sing because my high notes aren’t right” or “I’m a complete beginner and always sing out of tune” and have no idea why or what to do to fix it? Well, don’t let it discourage you! Instead, think about taking a singing lesson to find out exactly what is going on with your voice and get the help you need. Let’s put it into perspective. Think about playing the piano. You can see the instrument, press the keys and the individual notes sound wonderful. But, if I put the sheet music for Happy Birthday in front of you and asked you to play it, would you be able to? Probably not, because you have no idea what notes the keys are or what order they need to be played in to make the tune. You have an idea because you know the song, so you play what you think…..and it doesn’t sound anything like it’s supposed to. But – if I gave you a lesson on which keys are what notes, and showed you the order they came in for the song, you’d be able to play it after a period of time. Singing is the same – except we can’t see your instrument, only hear it. That’s what makes it more difficult for us as singers – we can SEE and HEAR that we are playing the wrong note on the piano, that’s easy to fix. But with the voice, we can only HEAR what’s wrong and quite often have no idea how to fix it. In fact sometimes we actually have no idea that it’s wrong until we hear a recording of ourselves. The voice is a tricky thing – it’s a complicated balancing act of air and muscle that are both required to produce a sound. Most of these muscles are tiny (some smaller than a pin head), so it’s no wonder we can have problems and issues with our voice! Imagine trying to use a muscle that you have no conscious control over, one you can’t see and that is smaller than a pin head…..hard isn’t it! 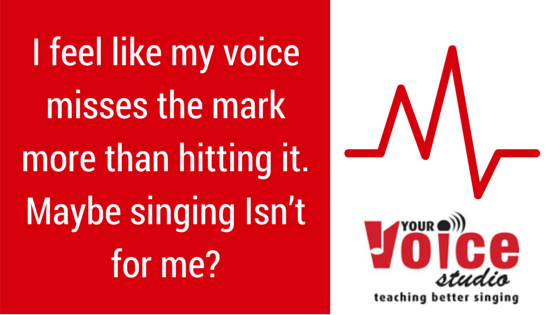 So, if you think that your voice needs a bit of help, why not get in touch? Here at Your Voice Studio, Edinburgh, we can hear these things in your voice. We have specific training on what to listen for, and how to fix the problems you may face. We will explain to you what we can hear, what sort of thing we need to do to help you, and show you how to do it. The golden rule here is: Don’t be discouraged or give up. Let us help you unlock the potential in your voice! Find us on our social media channels below, or email us. Share with us your tips on overcoming issues in your voice – we’d love to hear from you in the comments below!